A mechanized infantry squad with Chaos Company, 1st Battalion, 68th Armor Regiment, 3rd Armored Brigade Combat Team, 4th Infantry Division, engages targets during a platoon live-fire exercise at the Grafenwoehr Training Area, Germany, July 28, 2017. 1st Battalion, 68th Armor Regiment is testing company readiness while training toward the battalion’s participation in 3/4 ABCT’s live-fire exercise during Combined Resolve IX in August. Photo by Capt. Scott Walter. GRAFENWOEHR TRAINING AREA, Germany — As they maneuver through a forest on a mission to clear an objective in a nearby town, infantrymen of Chaos Company, 1st Battalion, 68th Armor Regiment, carefully scan their sectors of fire while navigating dense terrain. “Twelve o’clock, 300 hundred meters!” shouts platoon leader 1st Lt. Charles Gough. The Soldiers react instinctively, laying down a base of fire at training targets that have popped up. Gough jumps from one command to another on the radio with his squads, both dismounted in front of him and mounted in M2A3 Bradley Fighting Vehicles nearby. He orchestrates a symphony of motion in the form of Battle Drill 1, a platoon attack, amid the chaos. This was a common scene during a week of platoon live-fire exercises from July 22-28 that geared up the companies of 1st Battalion, 68th Armor Regiment, for a more complex live-fire exercise that will be conducted Aug. 18-22 by the 3rd Armored Brigade Combat Team, 4th Infantry Division as part of Combined Resolve IX here. It’s also one step at a time, as the battalion’s companies continue to go through a combined arms live-fire exercise this week to ramp up for a larger objective to sharpen overall readiness in support of Operation Atlantic Resolve. For young leaders like Gough, the realistic training is a way to assess his Soldiers’ — and his own — strengths and weaknesses in a heated situation. For Capt. Todd Pepino, the Chaos Company commander, it’s a chance to revalidate skills his Soldiers first trained on while working with Estonian Defense Forces from February to June as part of Operation Atlantic Resolve. His Soldiers provided a persistent presence to deter aggression in the northernmost flank of NATO during that exercise. Now they hone those skills in a more centralized training area. While at Tapa Training Area during Atlantic Resolve, his unit leaned on the Estonians for support; now in Germany, they have their parent brigade with which to train in combined-arms capabilities. “All of our training up to this point was nested with that combined-arms mindset. Team and squad live-fire, the dismounted with the Bradley integration, clearing the anti-tank threat in order to push Bradleys forward and destroy a larger mechanized force,” said Pepino. The summer environment in Germany provided a different sheen to the training, yet the Soldiers stayed focused while in the midst of a three-week run in the field. 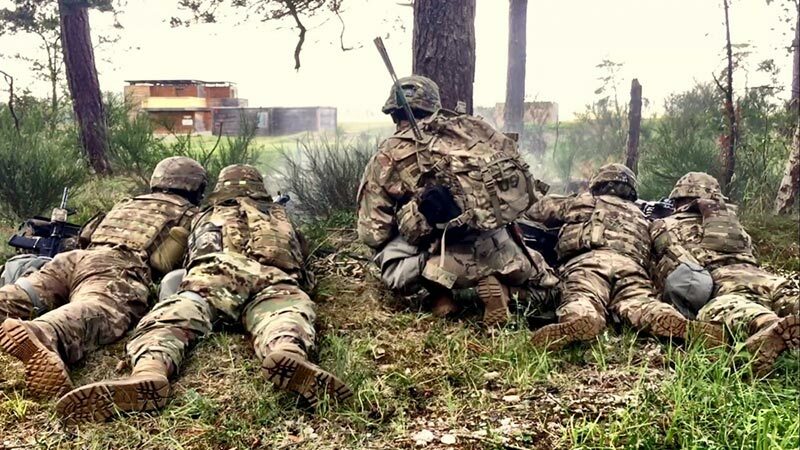 Despite extensive training in Estonia that included live-fire exercises, tank and Bradley crew qualifications and the multinational field exercise Spring Storm, the training here in Germany offered a new slate for Chaos Company. Gough, for example, spent a period of time in Lithuania relying on younger Soldiers. “I didn’t have a platoon sergeant for most of the time I was there. I relied on my squad leaders, and they did an amazing job by stepping up and showing their maturity,” he said. The growth was evident this past week as his dismounted squads breached a concertina wire obstacle then quickly cleared one building after another, while the squad in the Bradley Fighting Vehicles engaged targets outside the town that was their training objective. An even younger leader, Cadet John Schannep from the U.S. Military Academy who is participating in the Cadet Troop Leader Training program, observed as Gough conducted his battle-drill symphony.